A two years or so ago I began a series of review articles on the various books in my brewing library. I had meant that to be a continuing series, but somehow it all got away from me and I now find myself with over a years worth of accumulated books and not a single word written about any of them. This book takes a very different approach to its audience than most brewing books. One complaint I’ve made about a number of brewing books is that they aim at a very large audience – often to the detriment of the book. For example, Jamil’s book “Yeast” targeted both home & commercial brewers, leaving both with too few details in some places and extraneous details elsewhere. From the point of view of a publisher this approach makes sense – the larger the audience the better the commercial success – but often the reader is left wanting more in some places and less in others. One pleasure of this book is that it is targeted squarely at the experienced home brewer – space is not wasted on “common knowledge” items (terminology, brewing process, ingredient characters, etc), nor is space spent on issue only of interest to commercial brewers with hectolitre tanks. The data-heads out there will appreciate the more systematic approach to the presentation of graphs & data – e.g. giving R2 values for data fitting – and I really appreciated the mathematical approaches taken in some sections. Most of the time this approach works, but there are some cases where the author assumes a level of knowledge beyond what most experienced home brewers would have, leaving even the target audience (and admittedly, scientists such as myself) a little lost. There are also a few sections that are erroneous, or where the author repeats common misconceptions. But these sections are outweighed by the otherwise great information and unique information found between the pages of this book. I’d also add that this is the first book to my knowledge which does a detailed analysis and description of brew-in-a-bag, which is an ever more popular way of brewing. 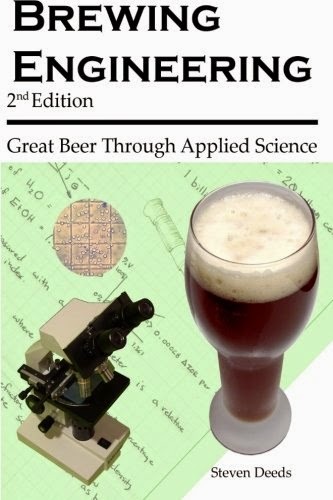 Overall this is a good book – but one which you won’t want to add to your shelf until you’ve moved past basic brewing and are moving onto a more advanced and technical approach to your hobby. As always, more below the fold. As mentioned in my intro, this is the first book to my knowledge to really get into BIAB. Yes, many books have described how to BIAB, but this is the first one where aspects like the fermentability of the wort, brewhouse efficiency, optimal grain:water ratios, and achieving your target OG & FG have been extensively covered from the perspective of BIAB – and yes, before you ask – it is different than achieving the same ends with batch or fly sparging. There is also an extensive section on yeast starters, which is generally quite good, and covers topics such as maximizing yeast yield and health. Many of the more technical aspects of yeast ranching are also covered – e.g. viability testing & pitch rates – though-be-it at a lesser degree of detail than other parts of the book. One part in the yeast section I found particularly interesting was the authors experiments into yeast washing and the impact on cell numbers, trub carry-over and viability (spoiler alert: washing is seldom worth it). One of the real strengths of this book is the pulling together of the authors experiments alongside the experiments of other brew-authors and brew-bloggers – often in a way which some consistency to these often disparate results. There were a number of places in the book where I struggled; there is a lot of information in tables throughout the book, but the tables themselves are often presented with only a minimal amount of explanation In more than once case I found myself re-reading a chapter simply to interpret a table. Likewise, some potentially useful things are not described in sufficient detail – as one example, the author briefly describes adding trimming potentiometers to an electronic thermometer in order to enable calibration, but does so in a manner that only an electric engineer could follow. There are are number of places in the book where thing like this occur – as another example, the mathematics for calculating fermentation time are presented raw and with little explanation. The author makes a number of statements that seem odd – for example, his claim that trub losses in all-grain setups are generally around 20%; I’ve been brewing for 17 years, and a look at my notes over that time show that regardless of my setup, the only time I’ve been over 5-8% is when I’ve used obscene amounts of hops. My current setup looses about 1L kettle volume, meaning my losses are ~1% for a 22L (5.5 US gal) or ~0.5% for a 45L (12 US gal) batch. A quick google search suggests that my experience is more a norm than exception. In other cases statements are made that are outright confusing. For example, the treatment of IBU’s (which is a very specific measure of total solubilized alpha acids per volume) as though they were HBU’s (which is a more arbitrary measure involving hop weights and total alpha acids – regardless of what portion would be extracted into the beer). But of greatest concern are the things that are outright wrong. The instructions given for adjusting the illumination of a microscope would act to degrade image resolution and contrast. Likewise, the author recommends what amounts to serial feeding as a method to avoid using a yeast starter – a recommendation which makes the microbiologist want to pull out my hair (that is, if I had hair). The whole point of a starter is to avoid the stresses associated with events like serial feeding. Likewise, his description of pH (balance between positive and negative ions) is completely wrong – pH is the negative log of the concentration of free protons in a solution, and is independent of other ions – positive or negative – in the solution. In re-reading my “problems” section I think I made things sound worse then they actually are. By and large this book contains a lot of useful information that advanced home brewers will really appreciate. If you are serious about BIABing this book is a must buy; likewise, its a must-have for brewers who like to engage in their own experimentation. However, it is important to read this book (and all others) with a critical mind as there are errors which, if not noticed, could mislead a brewer. Bryan, just found your site. Excellent! I have to say I was very disappointed in Brewing Engineering. I spent money on the first edition – and the sheer level of editing issues – and outright errors were large. To be fair, the second edition may have fixed most of the problems. By serial feeding I mean pitching the yeast into a portion of the wort, and once fermentation has run for a while, adding the remainder of the wort. In other words, its a low-tech version of batch feeding, which is reputed to produce poor quality yeast from a brewing perspective. The microbiology though is what bothers me. Ignoring the risk of the wort "held back" of becoming contaminated over the day or two prior to adding it to the ferment, serial feedings are generally avoided because they add stress and increase by-product production (which could potentially include esters and fusels). For my own personal curiosity, do you mind elaborating a bit on your point about serial feedings?